We would like to share with you some exciting news, we have recently become the proud owners of one of the 3 Lonsdale belts won and owned by Sir Henry Cooper who was considered the greatest heavyweight boxer in modern British history. 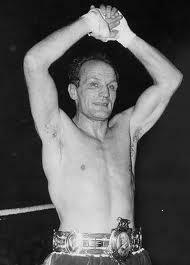 Sir Henry Cooper was an honoured, respected, and popular man in the <?xml:namespace prefix = st1 ns = "urn:schemas-microsoft-com:office:smarttags" />UK and Worldwide. Sir Henry will be mostly remembered for his “nearly, almost” fight when his mighty left hook dumped Cassius Clay on his backside, Henry would also have a re-match with the Greatest of All Time who through religious beliefs had changed his name to the legend who is Muhammad Ali. Cooper had a prestigious fight record winning 40 fights out of 55 of which 27 were by knockouts. The Lonsdale Belt shown above was won when he defeated Johnny Prescott in1965. He would later defend the title twice in 1967 by beating Jack Bodell and Billy Walker which gave Cooper the rightful ownership of the illustrious belt. We would like to share our splendid acquisition with other fans and invite you to get up close and personal with this beautiful and rare belt which was manufactured by Mappin and Webb (Silversmith to Her Majesty the Queen and His Royal Highness Prince Charles). We are hoping to take invitations to display the belt at forthcoming functions such as amateur boxing club fund raisers, after dinner and white collar events and other promotional activities. If you are interested and would like to use this belt as a sensational promotional appetizer then please contact us via the website (aliclay@tiscali.co.uk ) or telephone number 07969171066.